What is false acceptance rate or FAR? What is false recognition rate or FRR? Here, we discusses some general principles of biometric recognition systems, describes different classification errors and explains how the quality of two systems can be compared objectively. In the identification case, the system is trained with the patterns of several persons. For each of the persons, a biometric template is calculated in this training stage. A pattern that is going to be identified is matched against every known template, yielding either a score or a distance describing the similarity between the pattern and the template. The system assigns the pattern to the person with the most similar biometric template. To prevent impostor patterns (in this case all patterns of persons not known by the system) from being correctly identified, the similarity has to exceed a certain level. If this level is not reached, the pattern is rejected. In the verification case, a person’s identity is claimed a priori. The pattern that is verified only is compared with the person’s individual template. Similar to identification, it is checked whether the similarity between pattern and template is sufficient to provide access to the secured system or area. We uses scores (also called weights) to express the similarity between a pattern and a biometric template. The higher the score is, the higher is the similarity between them. As described in the preceding section, access to the system is granted only, if the score for a trained person (identification) or the person that the pattern is verified against (verification) is higher than a certain threshold. Due to several reasons, this assumption isn’t true for real world biometric systems. In some cases impostor patterns generate scores that are higher than the scores of some client patterns. For that reason it is a fact, that however the classification threshold is chosen, some classification errors occur. For example you can choose the threshold such high, that really no impostor scores will exceed this limit. As a result, no patterns are falsely accepted by the system. On the other hand the client patterns with scores lower than the highest impostor scores are falsely rejected. In opposition to this, you can choose the threshold such low, that no client patterns are falsely rejected. Then, on the other hand, some impostor patterns are falsely accepted. If you choose the threshold somewhere between those two points, both false recognitions and false acceptances occur. The following figures should help to achieve a better understanding of this topic. Think of a biometric verification system, which is tested with a large amount of test data. The test data consists of both impostor and client patterns. Let’s first take a look at the impostor patterns. The belonging scores would be somehow distributed around a certain mean score. This is depicted in the first image on the left side. A Gaussian normal distribution is chosen in this example. Depending on the choice of the classification threshold, between all and none of the impostor patterns are falsely accepted by the system. The threshold depending fraction of the falsely accepted patterns divided by the number of all impostor patterns is called False Acceptance Rate (FAR). Its value is one, if all impostor patterns are falsely accepted and zero, if none of the impostor patterns is accepted. Look on the graphic on the right to see the values of the FAR for the score distribution of the left image for varying threshold. Now let’s change to the client patterns. Similar to the impostor scores, the client pattern’s scores vary around a certain mean value. The mean score of the client patterns is higher than the mean value of the impostor patterns, as shown in the left of the following two images. If a classification threshold that is too high is applied to the classification scores, some of the client patterns are falsely rejected. Depending on the value of the threshold, between none and all of the client patterns will be falsely rejected. The fraction of the number of rejected client patterns divided by the total number of client patterns is called false recognition Rate (FRR). According to the FAR, its value lies in between zero and one. The image on the right shows the FAR for a varying threshold for the score distribution shown in the image on the left. The choice of the threshold value becomes a problem if the distributions of the client and the impostor scores overlap, as shown in the next image on the left. On the right, the corresponding false acceptance and false recognition rates are displayed. Imagine the comparison of two biometric systems. The manufacturers of the systems just specify a single value for the FARs of them. Is this sufficient to compare both systems? The answer clearly is no, if the manufacturers do not provide the corresponding FRRs. In this case, it is possible that the system with the lower FAR has got an unacceptable high FRR. But also when the values for FAR and FRR are given, there still exists the problem, that those values are threshold depending. Assuming that the threshold of the systems is adjustable, there is no reasonable way to decide if a system with a higher FAR and a lower FRR performs better than a system with a lower FAR and a higher FRR value. Some effort is done to achieve large and publicly available test sets and protocols like the FERET and the XM2VTS databases for face recognition evaluation. But even if there exist some of those test sets for single biometric modalities, it still is very hard to compare systems relying on different ones (e.g. face and fingerprint). These days there is a lot of emphasize on FAR (False Acceptance Rate). It is good that clients are getting aware of these terms and asking the right questions before implementing a solution. However, FAR only provides half the information. When selecting a biometric solution, we need to find out what the false recognition Rate (FRR) is at the said FAR. So when a biometric solution provider claims to have a very low FAR, it is very important to find out what is the FRR at this ‘low’ FAR. 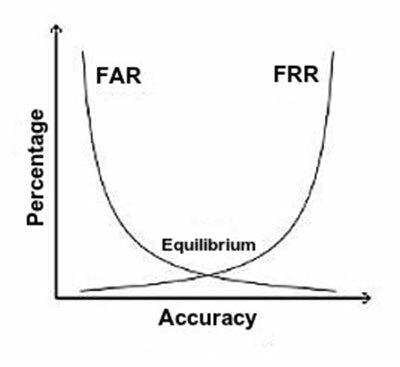 Then depending upon the application one needs to evaluate whether the FAR & FRR ratio is acceptable for the application. In a practical scenario a low FAR & a high FRR would ensure that any unauthorized person will not be allowed access. It would also mean that the authorized people will have to put their finger on the device several times before they are allowed access. Therefore, it is good to have a very low FAR, but please remember that if this low FAR is coming at the cost of high FAR then the solution needs to be re-evaluated.